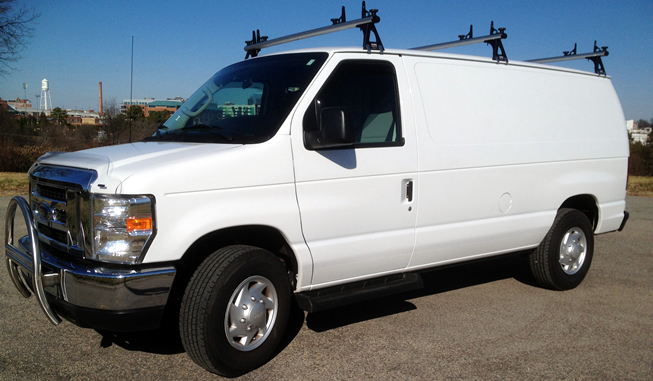 1 FORD E250 cargo van: You get 150 miles a day then .55 a mile after that and fuel expense to be reimbursed at the end of job. Expendables: gel, tape, sprays, sash, bailing wire, black wrap, diffusion, etc charged as used or not at all if reusable. Additional lighting, grip and electric available. Please see gear list if lighting, extra grip gear and/or electric is needed. 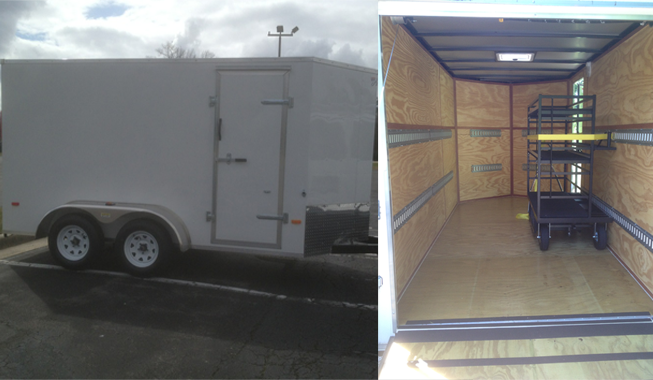 For larger productions add the trailer package which includes plenty of room, a backstage head cart and e-track lined walls to tie down whatever gear may be required. Camera sliders 2ft, 4 ft, 6 ft. Call for prices. Fisher 10 dolly Call for prices. 4, 6, 8, 10, 12 foot 1.25 inch pipe (works with Dana dolly) $.50 a foot. 1X1 LED flood Bi-color Litepanel $100 with batteries and charger $75 without. Quasar tubes also available $125.00 or $62.50 ea. $100.00 or $50 ea if only tungsten or daylight bulbs are needed. Kino Flo 4 foot single fixtures $25 ea. Diva 400 fixtures (daylight and tungsten bulbs) $62.50 ea. All fixtures come with a stand except for Large Tungsten and HMI heads, Kinos, reflectors, china balls and softboxes. 6500 watt putt putt generators, 500amp, 600amp, 1500amp tow plant generators available. Call for prices. Rag set includes: 1 single, 1 double, 1 solid, 1 silk and 1 griffolyn. Additional rags are available. Green screens, grids, muslins, etc. Call or email for prices. Frames do not include stands. Much of the above grip gear and carts come standard with the van/grip package which rents for $150 a day. You can order whatever lighting, electric and additional grip gear a la carte with the van. Also, if you don’t see it in the list, chances are, I can find it for you. Generators, cranes and jibs, dollies, sliders, special effects, picture cars, car rigs, walkie-talkies, large tungsten instruments, HMIs, camera support and etc.